You would think that having grown up in Louisiana, though at the opposite end of the state from New Orleans, I would know a little about Mardi Gras. Basically, all I ever knew was that it was a very big celebration held every year in New Orleans and also celebrated in some other cities. And there is always a Mardi Gras celebration in Galveston, which is an hour or so south of me. So I looked up Mardi Gras on Wikipedia and found the following explanation : “Mardi Gras, also called Shrove Tuesday, or Fat Tuesday, in English, refers to events of the Carnival celebrations, beginning on or after the Christian feasts of the Epiphany and culminating on the day before Ash Wednesday.” I have never attended a Mardi Gras celebration, but I have seen plenty of pictures. Recently a customer from South Louisiana brought a stack of t-shirts from Mardi Gras celebrations. She explained to me that it is much more than a bunch of drunk college kids partying in the streets. It is a big family event filled with parades and parties for all ages. 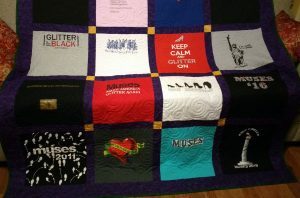 So I made a t-shirt quilt for her to take with her to New Orleans when she goes to celebrate with her family next week. We picked colors associated with Mardi Gras and used purple sashing and borders, gold cornerstones and green backing and binding. If you have an annual celebration that you attend and have collected a bunch of t-shirts, give us a call and we’ll be happy to make it into a nice keepsake.